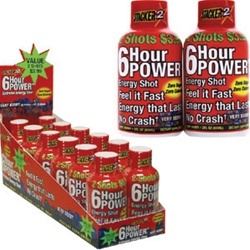 Two bottles of 6 Hour Power Energy Shots are packaged together and are pre-priced at just $3.99 retail for the 2 pack. This offers a better value for your customers while providing you a 30% profit margin. Serving Size: 2 fl. oz. OTHER INGREDIENTS: Filtered water, Glycerin, Natural Flavors, Caramel Color, Potassium Sorbate & Sodium Benzoate (to protect freshness), Sucralose. CAUTION: Contains about as much caffeine as a cup of brewed coffee. Limit or avoid products containing caffeine to avoid jitters, sleeplessness and rapid heartbeat. 6 Hour Power contains Niacin (Vitamin B3) so some people may experience a flush feeling, hot sensation or redness of skin that lasts for a few minutes. Not for use by children, pregnant women or individuals sensitive to caffeine. Do not consume more than 1 shot every 6 hours.